Is there something geeky you've been looking for for so long that you begin to doubt that it even exists? I don't mean you've seen it but didn't buy it (from a Geek Fair dealer or on eBay but at a price you couldn't quite justify at that moment). I mean you have NEVER seen it. Ever. Not when it was first published and not in the intervening decades of trawling second-hand book shops, charity shops, comic book stores, geek fairs and anywhere else such goodies may occasionally be found stuffed in an unloved box in the corner). This THE MIGHTY WORLD OF MARVEL SUMMER SPECIAL 1983 is one such item which I FINALLY tracked down and bought online last week. It wasn't very expensive. Nor does it seem to be particularly desirable. It's just elusive. Maybe Marvel printed less copies. Maybe the distribution was particularly shoddy. Maybe everyone who bought a copy loved it so much (unlikely) that it's never left their collection. 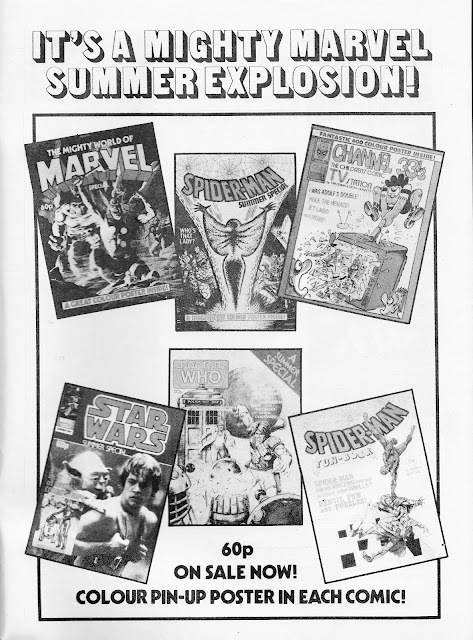 I knew the special existed thanks to this Summer 1983 House Ad which ran across the Marvel UK line, including in the specials featured. Over time I've tracked down copies of each and ever one (with the exception of the STAR WARS one, and that's always going to be harder to find because it features some of Alan Moore's SW strips originally published in the monthly). Even the SPIDER-MAN FUN BOOK (a compilation of puzzle pages and SPIDEY SUPER STORIES reprints, effectively a primer for the 1985 relaunch of THE SPIDER-MAN COMIC) proved easier to find. And I doubt that flew off newsagents shelves at the time. 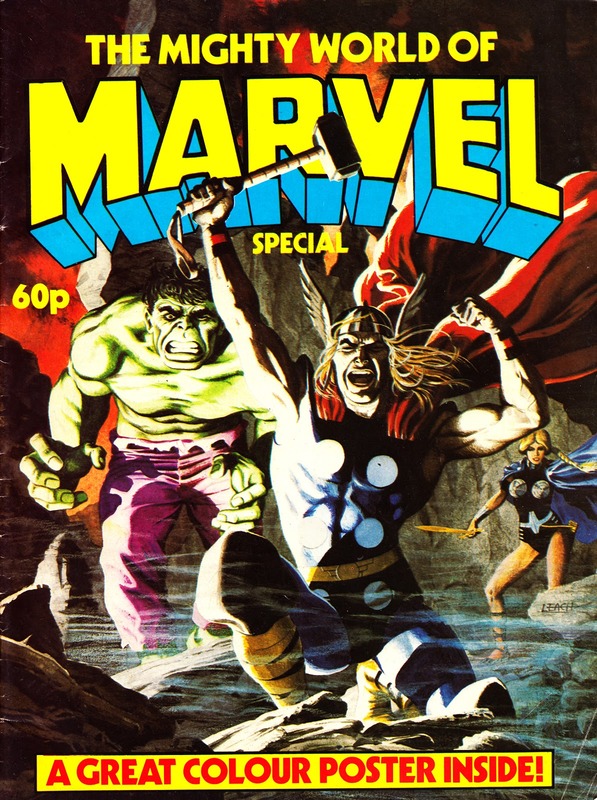 THE OFFICIAL COMIC BOOK PRICE GUIDE FOR GREAT BRITAIN also listed it. But that wasn't a sure sign it was ever actually published. Maybe they had just looked at the same advert I had and assumed it was out there. Somewhere. So elusive was the one-shot that I began to assume it had never been published. Maybe Marvel had cold feet at the last moment. Maybe distributors didn't want to carry it. Maybe there was a problem at the printers and the presses never rolled. Maybe it never left the warehouse and was still sitting somewhere, bundles of them turning more yellow with every passing year. Periodically I would type the title into eBay and see if anything appeared. It never did. Until last week. And now it's mine (ironically I nearly missed out on getting it again by forgetting to bid). It's nothing particularly special although it is, in its own way, mildly historic. It's the first MWOM (Marvel's first weekly, of course) published by Marvel UK since the ailing weekly was rebooted, by Dez Skinn, as MARVEL COMIC in early 1979 (the lineage of the weekly can actually be tracked all the way through the short-lived Marvel Comic to MARVEL SUPERHEROES and onto the second THE MIGHTY WORLD OF MARVEL. But we'll get to that in a mo). It also roughly coincides with the launch of the second MWOM. Exactly which appeared first is lost to the mists of time (they both officially appeared in June 1983) which means its unlikely that Marvel considered this a pilot for the new monthly. But, despite appearing around the same time, there's nothing in the special to point people to the regular comic. The choice of strips is also a little odd. 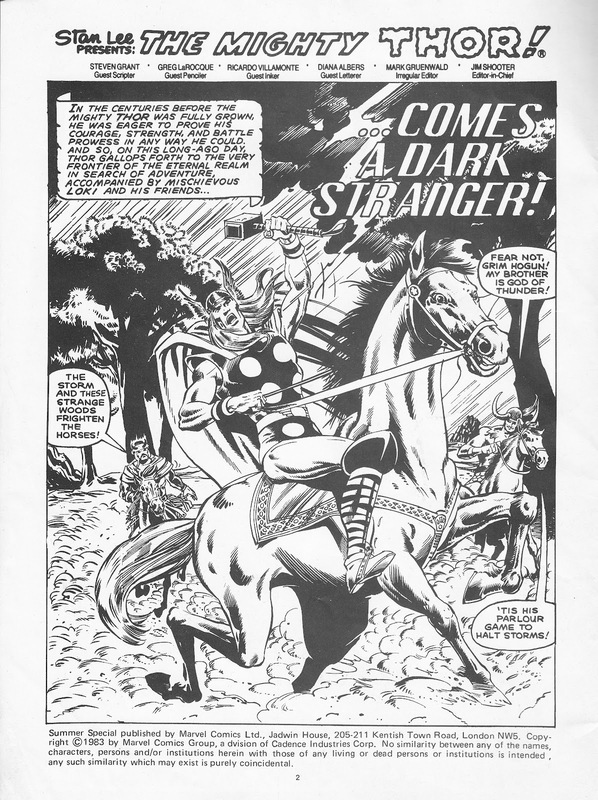 The Mighty Thor was a M-UK mainstay, bouncing from title-to-title. The special coincided with the launch of his own (short-lived) full-colour weekly. The special even includes a time-sensitive house ad (the special would be on sale all summer) for the launch issues of both THOR and THE X-MEN. 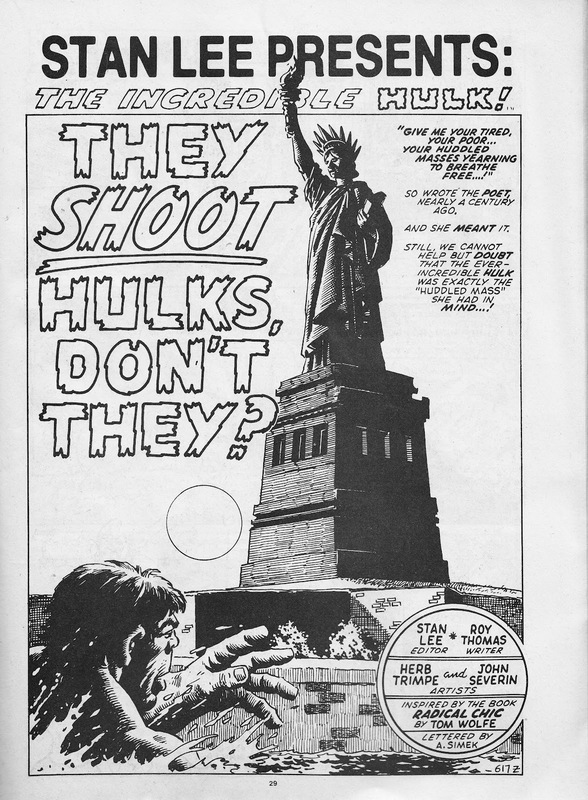 The Incredible Hulk was something of a safe bet, with a strong mainstream media profile. He also didn't have his own summer special that year. Of course, he was also a mainstay of the original MWOM (as well as having two solo weeklies) so, maybe, Marvel were milking the nostalgia factor. The strip, which dates all the way back to 1971, had almost certainly appeared in the original MWOM although I don't have the issues to hand. The format is glossy cover and centre-spread with black-and-white interiors. The back cover was the ubiquitous DOCTOR WHO/ CYBERMAN t-shirt advert which I've discussed in a previous post. The cover is an original piece by Gary Leach and also forms the glossy centre-spread poster. One has to wonder what came first: the contents or the artwork. If it's the latter, did Marvel pick strips that matched Leach's work? None of this is intended to suggest that this is a valuable comic. It might be rare but doesn't seem to be desirable. It just eluded me for so long that I really wanted to see what was in it. For me, it was an annoying gap in my knowledge of the Annex-of-Ideas output. My fault they are so rare. I got two at the time. Aha! So you are to blame! You've inadvertently cornered the market in MWOM! You jammy bugger, been looking for this fir years too ! Would you be able to scan the poster ? Sorry I missed your message before. So it wasn't just me that never found a copy anywhere in the intervening 30-odd years. I reckon this one must have really suffered from a low print-run or sloppy distribution. The poster will be no problem. But I'll need to unearth this issue again first! I will have stuffed it into a box somewhere. I don't remember even seeing the poster... I hope my copy is complete! Hmm. Maybe I just wasn't paying attention! Keep watching... as soon as I find my copy I'll get scanning!